(1) Accept one 5 V TTL input signal, LO signal will result in the relais switched to the rest position, HI signal to the activited position (“dash” position), the switching signals are called A and A’, for relais A. (2) There should be an output-enable signal for all relais, to be able to de-energize the relais, because otherwise, the circuit can suffer if the relais is disconnected while powered; these latching relais only need a few 10s of Milliseconds to switch, power will be turned off, by the ATmega32L, 1 sec or so, after each switching event, just to avoid any unintentional short circuit or spike, and the positive supply line will carry a fuse. (3) The circuit should be able to handle any common relais voltage, 5, 12, 15, 18, 24 and 28 V. The relais I am using here are 24 V rated, but work fine at 18-20 V, and up to 28 V.
(4) It must be avoided, at all cost that both the A and A’ signals are active at the same time. This can cause nasty relais oscillation, and damage/wear of the expensive relais. We don’t want to rely on software control here, because things can go wrong, during startup, program freeze, and so on. The circuit is almost self-explanatory. 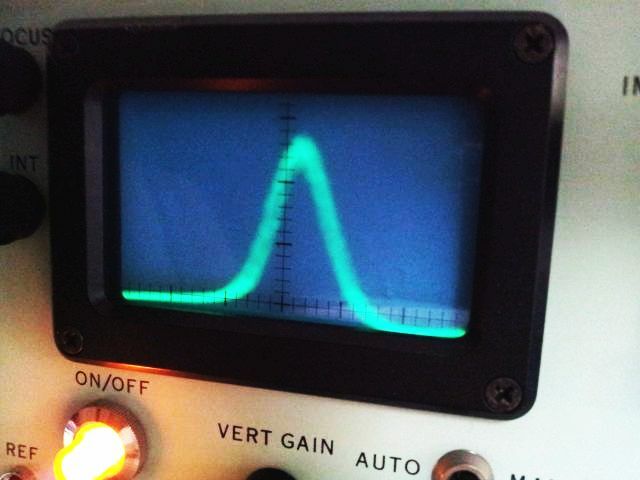 The LS04 generates the complementary control signals, from the digital input. The LS373 is configured as a transparent latch, in fact, the latch function is not used, but the output control function is. 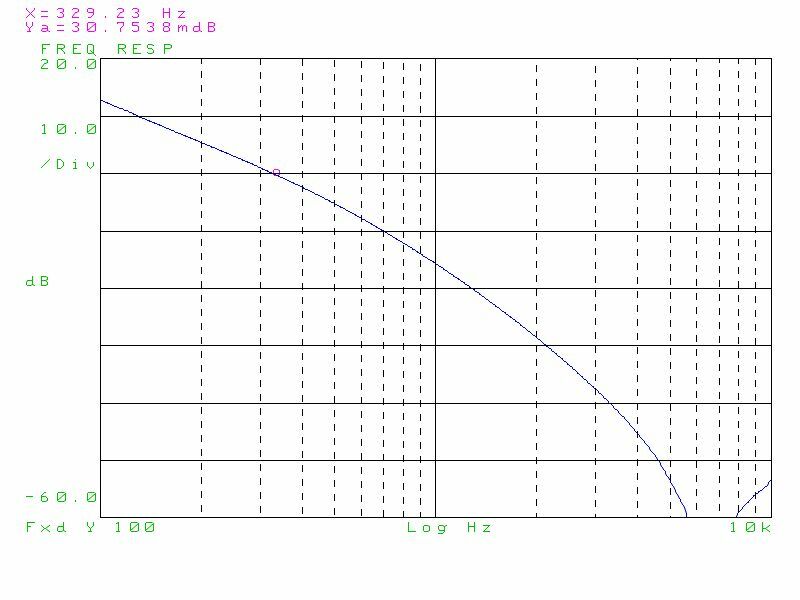 If the OC input goes LO (and thus, the neg_OC high), the outputs of the LS373 will tri-state High-Z. The output driver, a Toshiba ULN2803APG is used. These are very reliable circuits, Darlington transistor arrays with build-in diodes. Make sure to put a good quality capacitor close to the COM pin, the return path for the snubber diodes, otherwise, the inductance of the traces will deteriorate the action of the diodes. Actually, the HP coax relais have build-in diodes, so I don’t expect and issues with voltage spikes here. 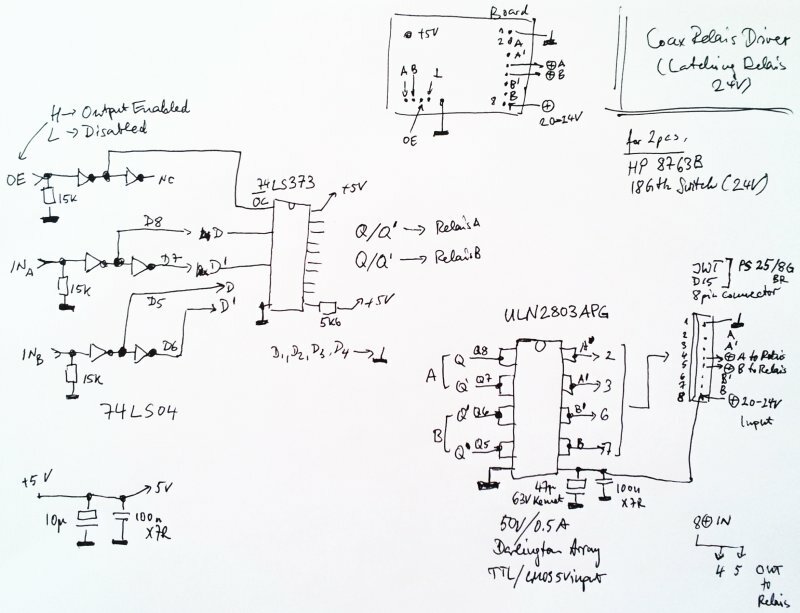 Note that the inputs of the ULN2803 have adequate resistors to ensure LO state when connected to a High-Z output; if other transistor arrays are used, the circuit might need some ~10 kOhm pull-down resistors to ensure noise immunity and defined signal levels. The 15 kOhm input resistors serve the same purpose, they keep the relais de-energized if no logic input is connected. This is the little board, with all space well used. Sure the logic could build using more modern devices, and I would definitely do so for a commercial device, or anything build in series, but LS logic is still popular, and it is cheap, at hand, and reliable. That’s the setup, with the two 8673B transfer switches, and a 0.3 Hz test signal fed to the digital inputs by the brown wire shown above (removed for the picture below). 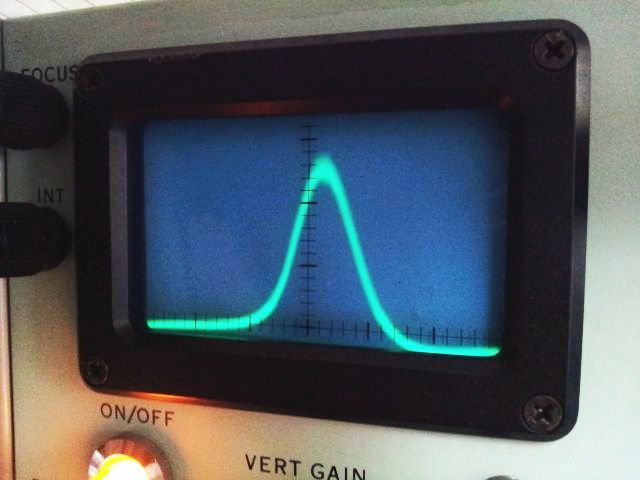 The signal at one of the contacts, 24 V drive level, 1 V per vertical DIV, 10 ms per horizontal DIV. No spikes, high voltages, or similar undesirable features are present. After about 2000 switching events, two events per 3.3 seconds, everything is still working well, and all circuits, in particular, the ULN2803 stays cool. As I said, not a very complex circuit, but may be useful for other purposes, and is a very cost-effective, reliable solution. 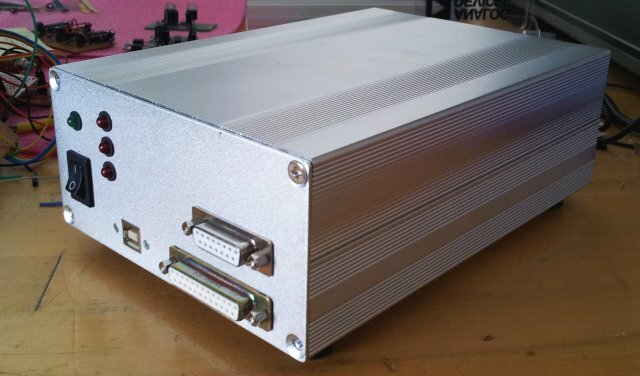 Comming back to an earlier project, the frequency stabilizers/PLL controls for the Micro-Tel 1295 receiver (2 pcs, one for through, and one for reflected power), and the Micro-Tel SG-811 generator (0.01-18 GHz). The setup has been working well, but it is an awful mess of cables, as a result of the development process. Now is a good time to finalize the circuit, and to put it into a nice case. 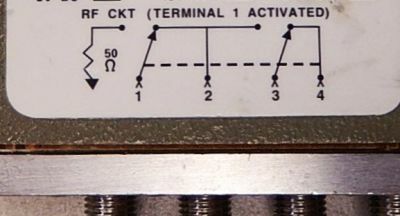 This is the front panel – the back panel has numerous BNC connectors, for the “PLL Phase Lock” voltage, and the “Frequency Control”, i.e., coarse tune voltage. The latter voltages, 3x 0-10 Volts, are generated by a DAC board, which is now ready and tested. Not a thing of beauty, but it works, and no reason to assemble another one just to clean things up a bit. 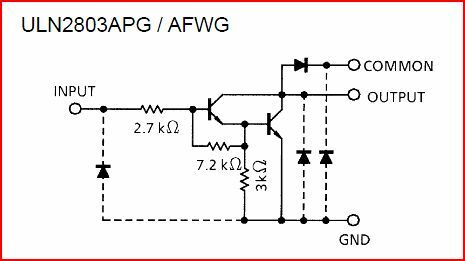 The circuit is reasonably straightforward, a 2.5 V precision reference is used, and three MAX541 16 bit DACs, followed by OP284 amplifier to convert the signal to the 0-10 V range. The MAX541, it’s a really great part, full 16 bits, +-1 bit integral nonlinearity, and very stable over temperature and time. Highly recommended for any precision application. One of the channels has an additional TLC2201 opamp, which is there more for historic reasons than for anything else. The PLLs use three ADF41020 18 GHz chips, following the approach discussed earlier. This will give 100 kHz frequency resolution, which is more than sufficient for the intended purpose of measuring gain/attenuation and SWR over the full range of microwave frequencies up to 18 GHz, or 40 GHz, if no SWR measurement is required. The 10 MHz reference circuit has also been completed, and is working well, converting a 10 MHz input signal (of more or less arbitray shape and amplitude) to 3x 10 MHz REF signals for the ADF41020, and two 5 MHz outputs, for the 1295 receivers, just in case I need to work with external downconversion-the 5 MHz signal is only affecting the 0.01-2 GHz range of frequencies. Well, why not having everything phase locked, if we can. The 10 MHz circuit has been modified slighly, to accept 1 kOhm impedance 10 MHz input signals, which are rather common for instrumentation purposes. Some caps and protection circuitry has been added, output levels are just about 0 dBm. No need to go to stronger signals, it will only cause spurious response, and other trouble, because shielding inside of the PLL case won’t be very strong. (1) A power supply regulator, +5, +3, +3 (Vp low noise), +15, +20 supply has been build, but need to be mounted to the case, for heat sinking. This will need to wait for a few weeks, need to wait for some travel to Germany coming up, where the metal working machinery resides. (2) Digital interface and cables for band control of the SG-811, and the two 1295s are complete, just need to be mounted and tested. (3) Relais control module needs to be designed and build – there are two 18 GHz transfer switches (one is needed for basic functionality, a second one for the various unexpected test configurations). 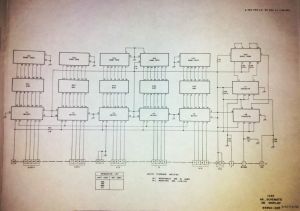 The transfer switches are HP 8763B, see earlier post. These are wonderfully precise and repeatable, albeit, list price is about USD 1k, each. (4) Need to route the two serial signals (dB reading, signal strength) from the Micro-Tel 1295 to the ATMega32L, which only one USART input – no problem, because this is all TTL-level USART signals, but need to get a multiplexer/a few NAND gates to set this up. 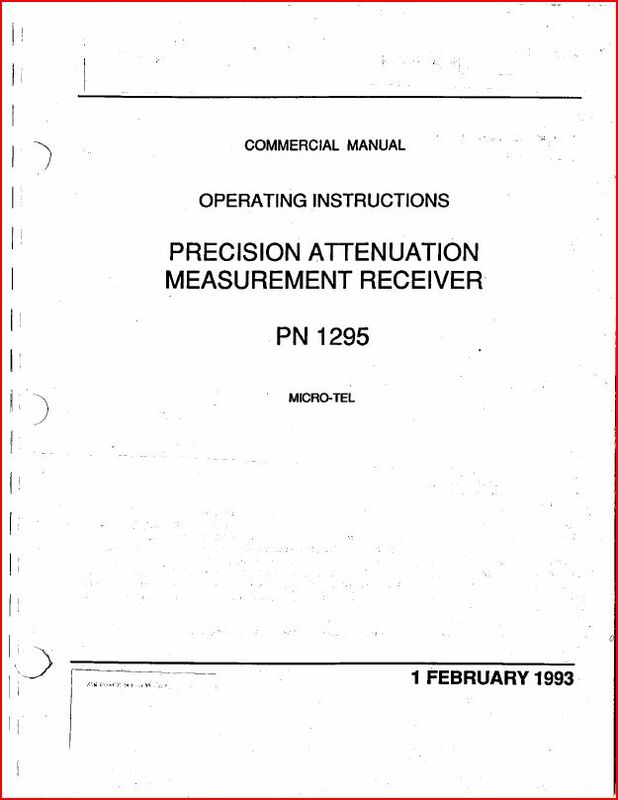 Currently, only one 1295 can be recorded at a time, which means, either gain or SWR measurement. 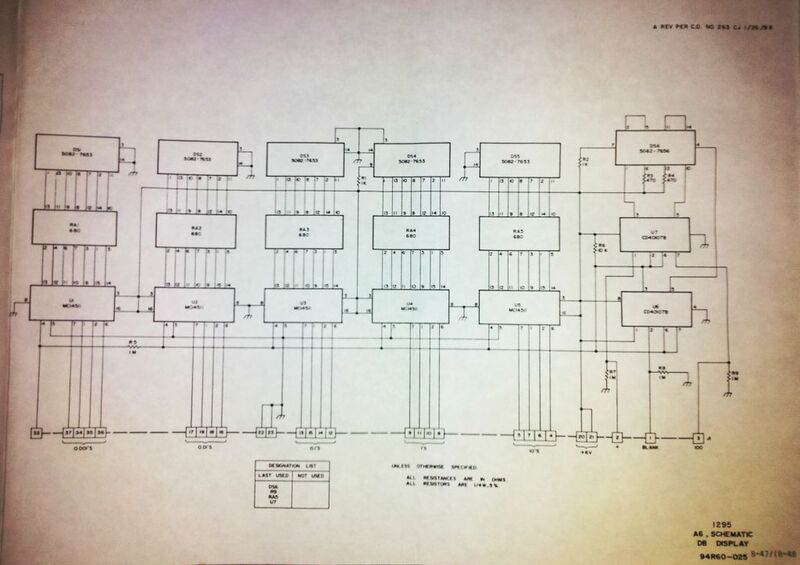 (5) Sure, the software, both firmware and instrument control software will need to be refined and consolidated. 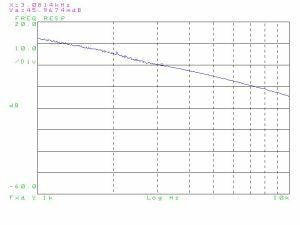 All PLL calculations and adjustments are done within the ATMega32L, still there is a need for a more convenient user interface than just command line. The 8763B is a very useful device, a 4-port coaxial switch, and has been sold for many years by HP, Agilent, and still sold by Keysight today. It is single-ended terminated, and has two latching switches. Two of these will give a nice transfer switch, for auto-calibration (through-connection vs. DUT) of the attenuator test setup. These switches are specified up to 18 GHz, and have a “max. 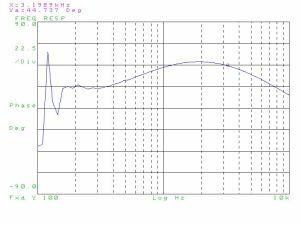 0.03 dB insertion loss repeatability”. 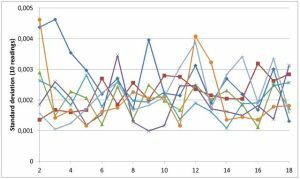 Now, the big question is, what is the actual repeatability. Knowing the manufacturer, it can be 10 or 100 times better, but you never know. 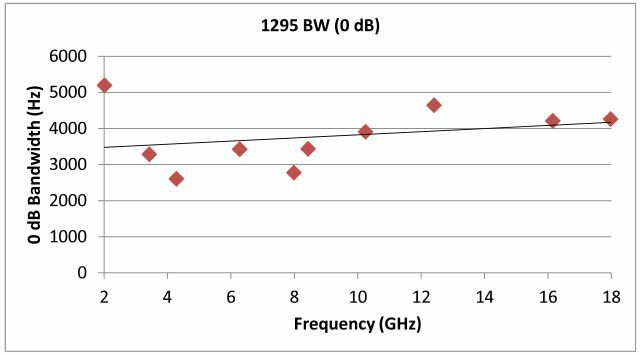 This is fairly critical, because a combined uncertainty of 0.06 dB, for the two 8763B forming the full transfer switch would be not acceptable for the purpose of calibrating attenuators to better than 0.1 dB precision/linearity. So, quickly hooked this up to the not yet auto-calibrating setup, and recorded power traces, 40 points each, 1 measurement per second, and switching the 8763B in and out every 10 seconds (vertical lines). This was done at 4, 8, 12, and 18 GHz, and for all ports of the switch. (green item on the right hand side is the feed line directional coupler, connected to the Micro-Tel SG-811 source; light blue test cable on the left is going to the Micro-Tel 1295 receiver). 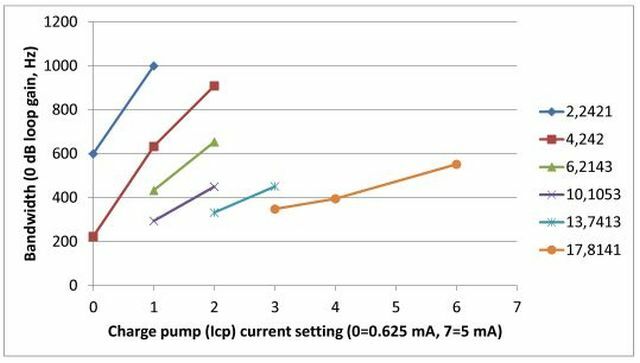 – There is not really any switching visible, and one can only judge that the repeatability is actually +-0.002 to +-0.004 – the noise of the measurement. It seems the only way to get more accuarate data will be to measure the repeatability with the two switches in series, in the final setup. Even though I’m using high quality microwave test cables, 0.002 dB amplitude stability, at 18 GHz is a challenge. 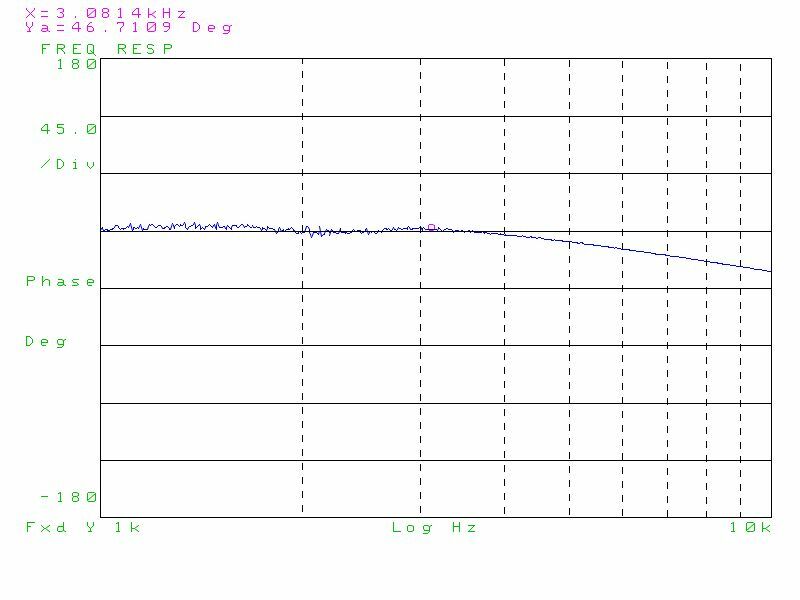 Will need to let the source and receiver fully warm up and stabilize, and use long integration times, like several minutes per switching event, to get data of 0.001-0.002 dB resolution. For now, it seems the switches will add much less uncertainty to the setup as initally thought. 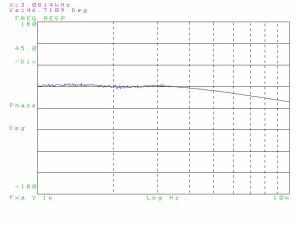 Attenuator calibration – first real dataset! Some items of the mighty precision attenuator calibrator setup are still missing, like the automatic auto-zero/through calibration, and the adaption of the reflection bridge (see earlier post), but nevertheless, all parts are now in place to do some first real measurements (and generate, thanks to computer control, more data than anyone could have ever recorded manually, without getting close to nervous breakdown). The device unter test (DUT). 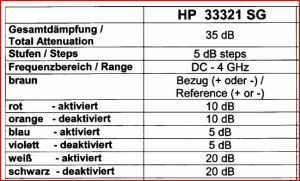 It is a HPAK 33321 SG step attenuator, 35 dB, in 5 dB steps – it is more or less a transmission line, with 3 resistor pads that can be individually switched in and out. Also, note the SMA to SMA connector needed to get things connected vs. a through line. 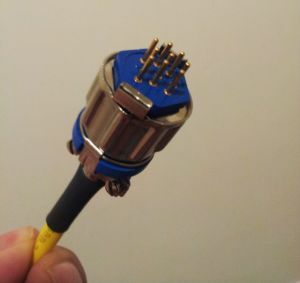 No allowance was made for this connector, it is a 18 GHz qualified precision part and will have very little loss. 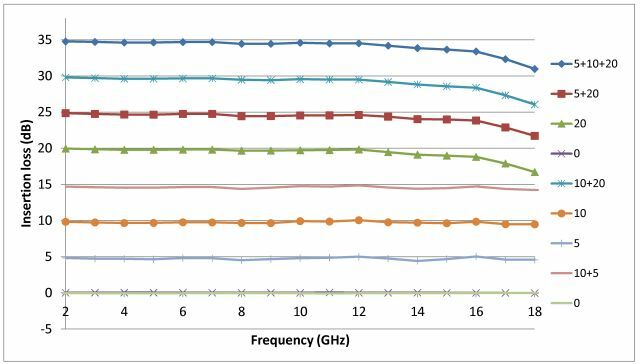 As you can see, it is specified for 4 GHz operation – there are multiple models of these attenuators, both from Weinschel/Aeroflex and HP/Agilent/Keysight, up to 26.5 GHz or more. 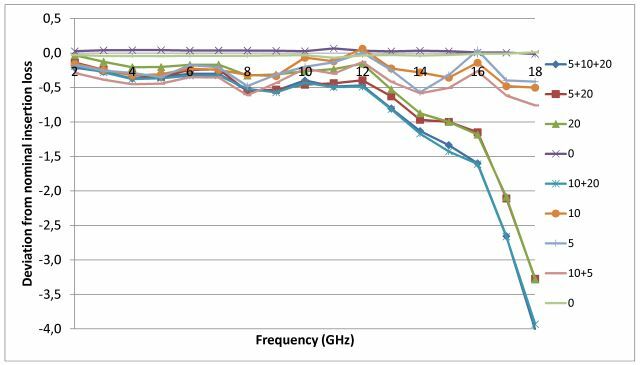 The 4 GHz models are relatively easily to come by, and others have claimed that these are actually quite usable up to higher frequencies. Let’s see. 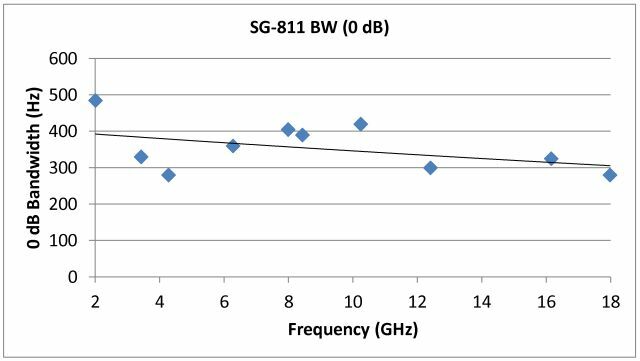 While I don’t have exact specs for the 33321 SG model, there are similar models around, and typically, the numbers given by HP are +-0.2 dB at 10 dB, +-0.4 dB at 20, and +-0.5-0.7 in the 30-40 dB range. Repeatability about +-0.01 dB, which is quite impressive. 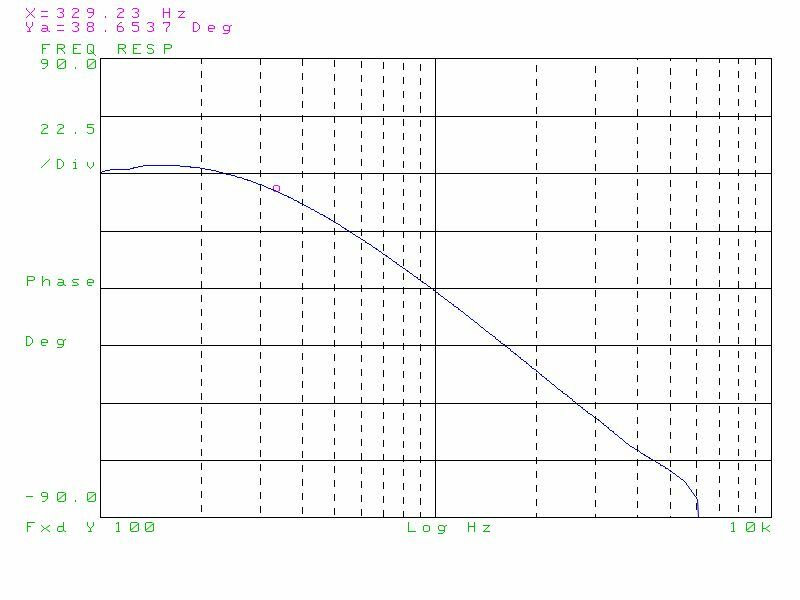 To be exact, we will be dealing with insertion loss here – not quite attenuation, but close, because no corrections have been made for any return losses (due to the SWR of the receiver and of the DUT, which might also change with attenuation setting). Step (3) – again, a through calibration. 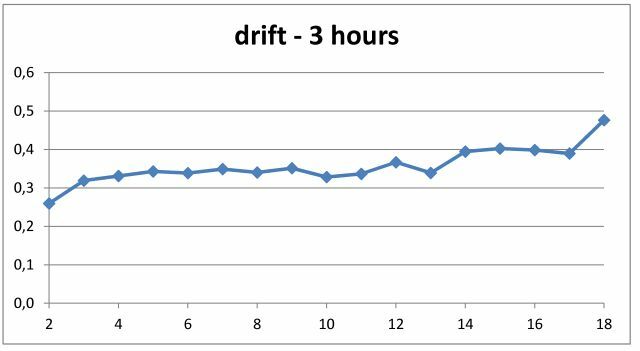 The measurements took about 3 hours – the drift was small, and distributed linearly with time over the measurements. Drift is pretty much independent of frequency. Later, there will be a drift correction anyway, by the yet-to-be-implemented auto-calibration feature. 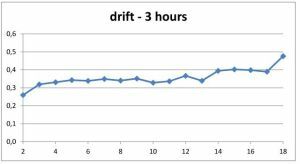 Drift – 3 hours; about 0.1 dB absolute per hour. 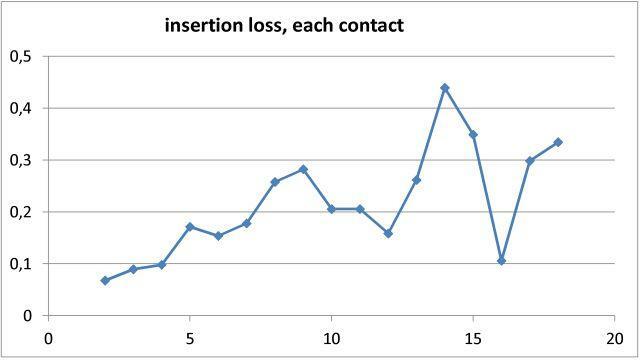 Insertion loss – relative to “0 dB” setting. This is relevant for most of the practical cases, where the 0 dB values are stored in a calibration ROM, and the levels corrected accordingly. 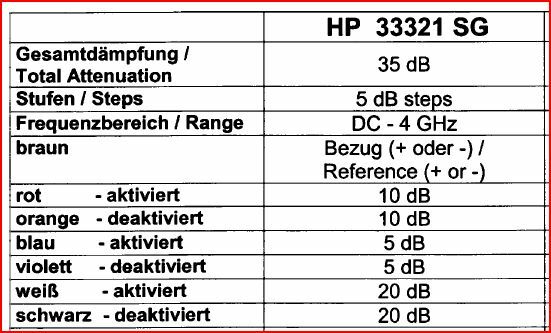 Repeatability of the 0 dB setting was also checked – standard deviation is about 0.04 dB, but might be much better short-term (more like the 0.01 dB claimed in the datasheet). 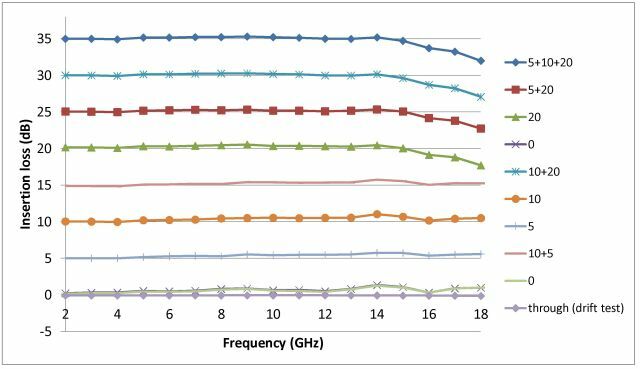 However, keep in mind, 0.04 dB at 10-18 GHz is not more than a few mm of cable movement, or a little bit more or less torque on a connector. So there are actually 3 combinations for each pad that allow determiation of the actual insertion loss, for each individual pad. 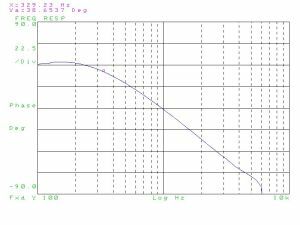 Furthermore, this utilizes the 1295 received at different ranges of the (bolometer) log amplifier, and with different IF attenuators inserted – and will average out any slight errors of the log amp, and calibration errors of the IF step attenuators of the 1295. For even more cancelation, the source power could be varied, but fair enough. The 5 and 10 dB pads are performing great, the 20 dB pad – a bit less. Well, there must be a way to tune this a bit – but don’t have a cleanroom here, and the fixtures, to scratch a bit of resistive mass from the pad, at certain places, etc. Wonder how they do this at the factory, and if in fact there is some manual tuning, at least for the higher frequency units. This is really a quite striking level of accuracy – much better than specification, and also indicates the level of precision already achievable with the still temporary attenuation calibration setup. Up to 12 GHz, no issues at all. The 0 dB loss – some might be in the connectors, some in the transmission lines, some in the “through” switches of the 3 attenuators. 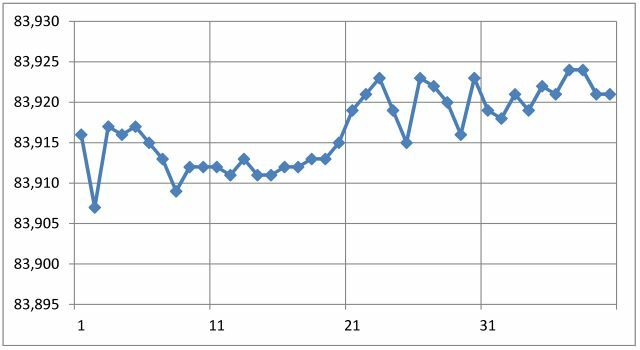 Simply assuming that there aren’t any losses in the connectors and transmission lines, this is the loss per attenuator switch, when in “through”=”pad switched out” position. 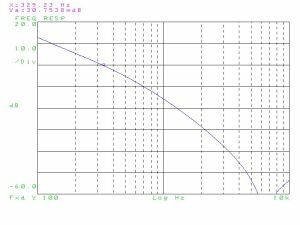 All in all, the best way to use these attenuators obviously is to very accurately measure the 0 dB insertion loss, on a pretty narrowly spaced frequency scale. 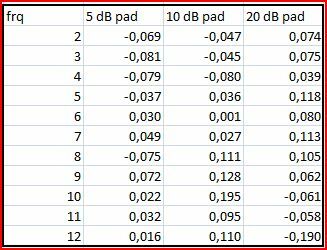 For the attenuator pads, these are best measured by recording values at various attenuations, and polynomial fits give very good approximation, without the need for a lot of density on the frequency scale, and seem to be merely additive, with little cross-correlation errors. Sure, such things can all be analyzed with much more maths involved, but I doubt it will impact much the application-relevant aspects, and would be rather just a numerical exercise. The Micro-Tel 1295 has a GPIB (IEEE-488) interface, and in principle, can be fully controlled through this. In principle, but, not with ease; and, as it turns out, the build-in processor is running on 70s hardware, and doesn’t respond well to my National Instrument GPIB card. The only thing I need are the attenuation readings, in dB, same as shown on the front LED display. Also, these GPIB cards are expensive, and I would rather like to control the whole attenuator calibration rig through one single USB port – also to be able to run in with various computers, not just with a dedicated machine. In brief, after trying hard, I gave up – there need to be a more practical way to read the 1295 data. First, how to get the data out, if not through the IEEE-488 interface? The case if fully closed, and drilling a hole, mounting a connector – NO. The modification should be reversible. 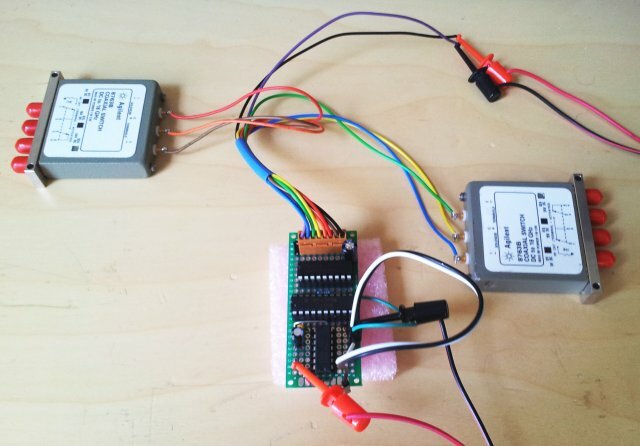 But there is a solution – the band selection connector, which is already used to remotely control the band switching, has a few spare pins! AMPHENOL/Wire-Pro “WPI” 9-pin “126 series” miniature hexagonal connector, 126-220; these connectors have been introduced in the 1940s, or latest, in the 50s. Still, available today… but the first piece of test equipment that I have ever seen that uses such kind of connectors. 500 Volts, 7.5 Amp – seems like a lot for such a small connector, at 14.99 USD each (plug only). So, how to run the full display info over one or two wires? Update rate is 1 reading per second, or 1 reading every 4 seconds, not a lot of data – still it needs to be reliable, easy to use. After some consideration, I decided to use a RS232 interface, with TTL level logic (rather than RS232 voltage levels-only using a short cable), and running it at 2400 bps, transmitting the data from the 1295 receiver to the main micro. 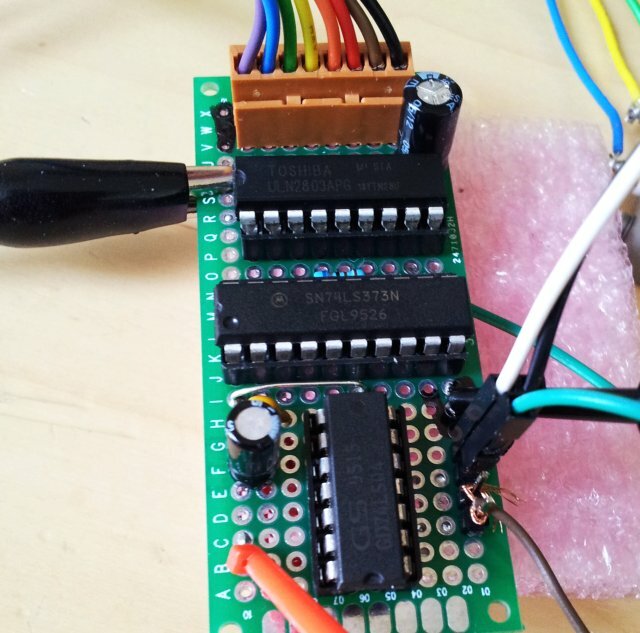 This main controller, an ATmega32L can easily handle one more incoming signal, via its USART, and buffer any data coming from the 1295 before it is requested over the USB bus, by the PC software. 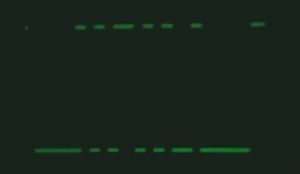 There are 5 full digits, plus a leading 1, a optional “+”, a leading-0 removing signal, and a blanking signal, which is set to low when the display is updating, or when the receiver is not giving a valid reading (over/underrange). Each digit needs 4 bits, binary coded decimal (BCD), so in total: 5×4+4=24 bits. 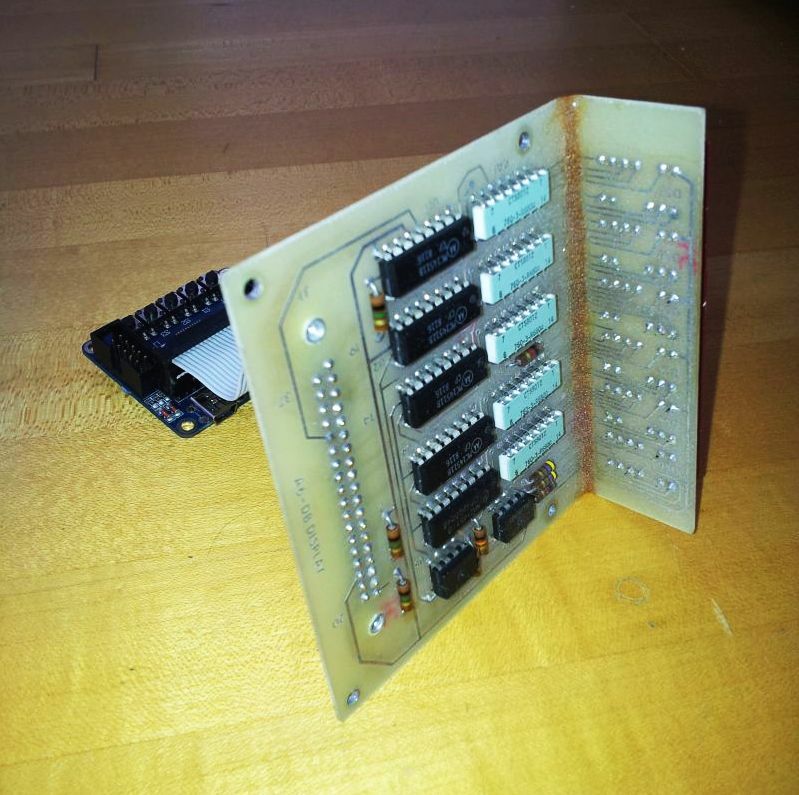 Perfect match for the A, B, and C ports of a ATMega32L. 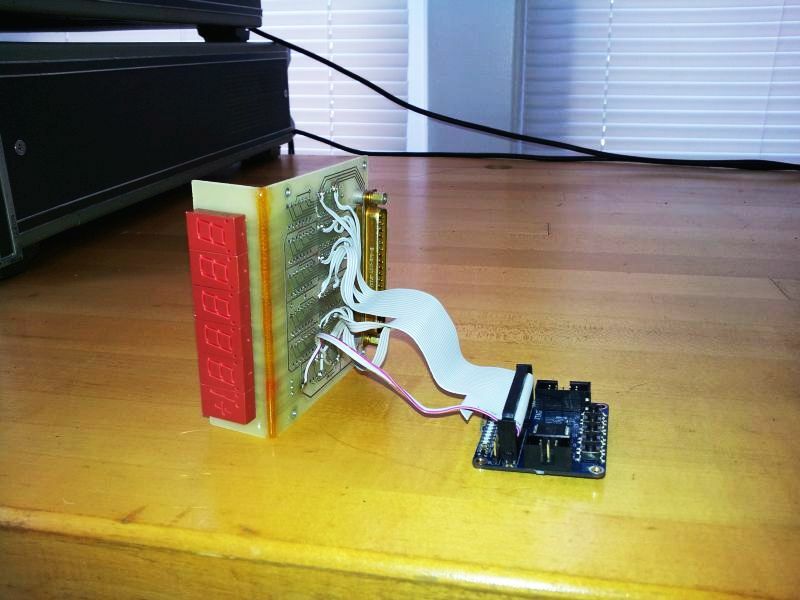 This micro will monitor the blanking signal, and after sensing an updated display, read out the BCD information, convert it into a readable string, and send it out at the 2400 bps, via a single wire, no handshake, or anything. Will just keep on sending. The easiest way to get the signal was determined to be directly at the display unit (A7) itself. There is also some space to fit the micro board, a commercial (Chinese, called “JY-MCU”, Version 1.4) ATMega32L minium board, with USB connection. These are really great, running at 16 MHz, with some little LEDs (which are on port B – disabled for this application), and a bootloader. It just saves a lot of time, and these boards are really cheap, below $10. A 34 pin ribbon cable, with double row connector, salvaged from an old PC – so the controller/parallel-to-serial converter can be removed from the 1295 if no longer needed, and even the cable de-soldered. MC14511 CMOS latches-BCD decoders-LED drivers – very common for 70s/early 80s vintage, and still working great! Now it is just a matter of some lines of code, and soon, some real insertion loss tests can start! Stay tuned. After some experimentation, measurements, etc. – as described before, time to wrap it up. 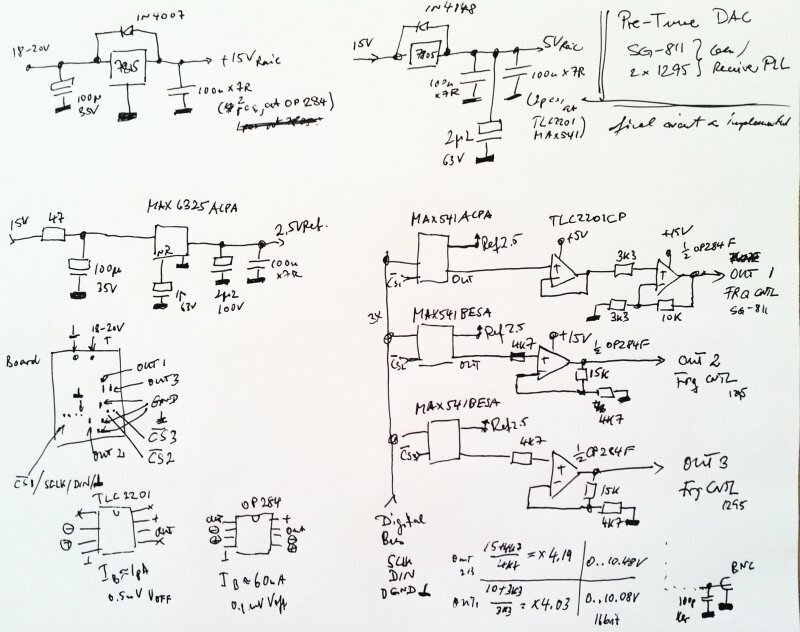 The PLL loop filter output is now connected to the phase lock input (the additional 1 k/100 n low pass in the earlier schematic has been omitted), with a 330 Ohm resistor in series. This will remain in the circuit, because it’s handy to characterize the loop, and to provide a bit of protection for the opamp output, in case something goes wrong, to give it a chance to survive. 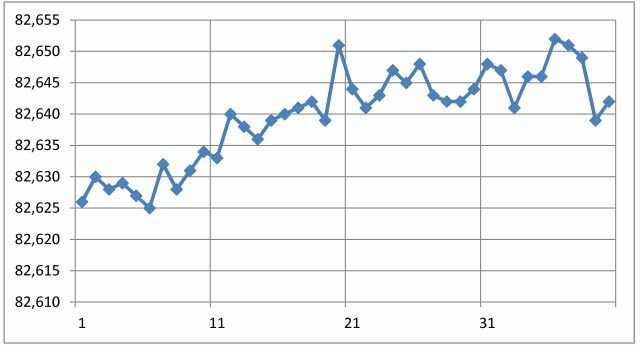 With the charge pump current adjustments now implemented in the software, that’s the result, all pretty stable and constant over the full range. 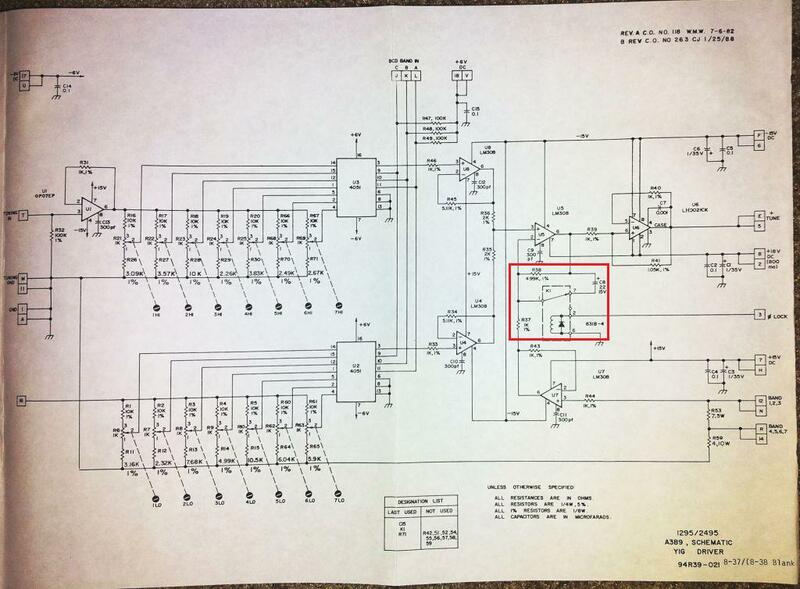 Step 1 – Programming of the ADF4157, no big issue – fortunately, all well documented in the datasheet. 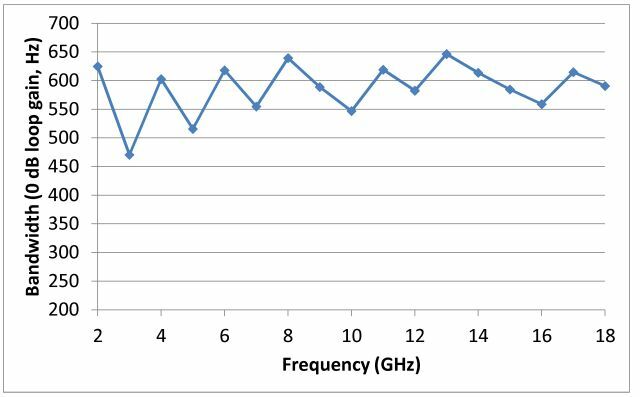 The 1.25 MHz phase detector frequency selected will allow tuning in integer-only (no fractional divider) 10 MHz steps (considering the :8 ADF5002 prescaler). One sigificant difference to the ADF41020 – the ADF4157 uses 16 steps for the charge current control (0=0.31 mA to 15=5.0 mA). 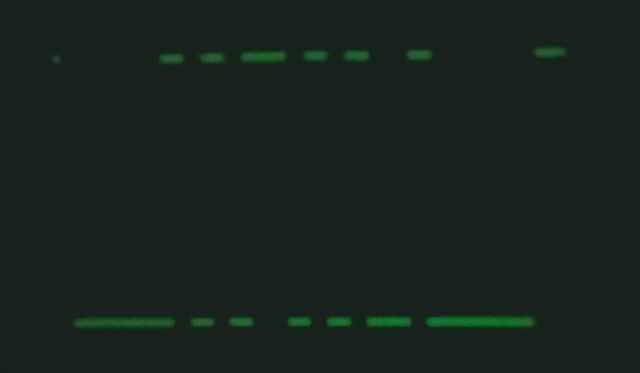 The PLL is locking fine, but still, significant noise in the loop, and also visible in the 1295 scope display, with a very clean signal supplied to the receiver… bit of a mystery. 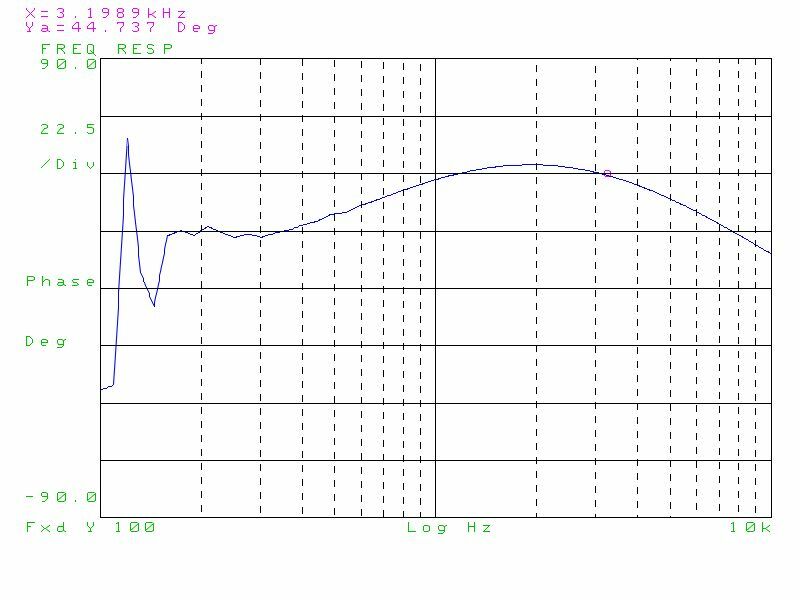 When the PLL is disengaged, and the 1295 manually tuned – no noise, just some slow drift. 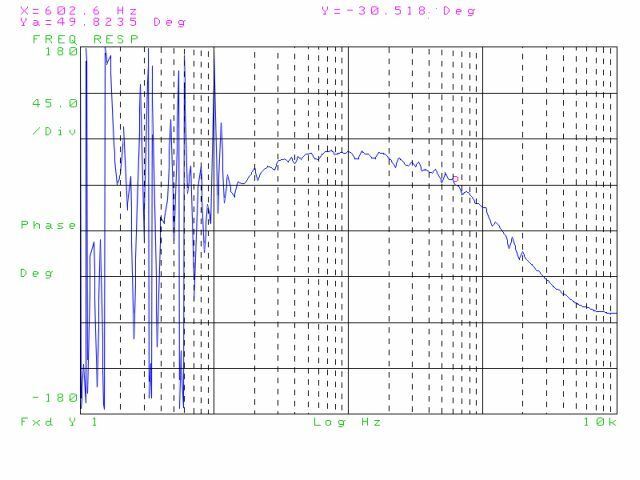 Step 3 – Increased loop bandwidth to about 8 kHz, even more noise – seems to PLL is working against a noisy FM-modulated source…. a mystery. Checked all cables, nothing is changing when I move them around. Step 4 – Some probing inside of the 1295, and review of the signal path for the PLL tune and coarse tune voltages. 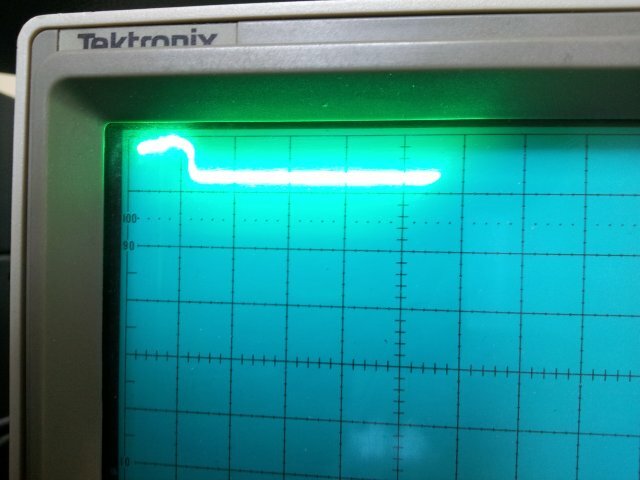 And, big surprise – there is a relais (K1) on the YIG diver board, and this disengages a low-pass in the coarse tune voltage line – it is a 499k/22 µF RC, several seconds time constant. 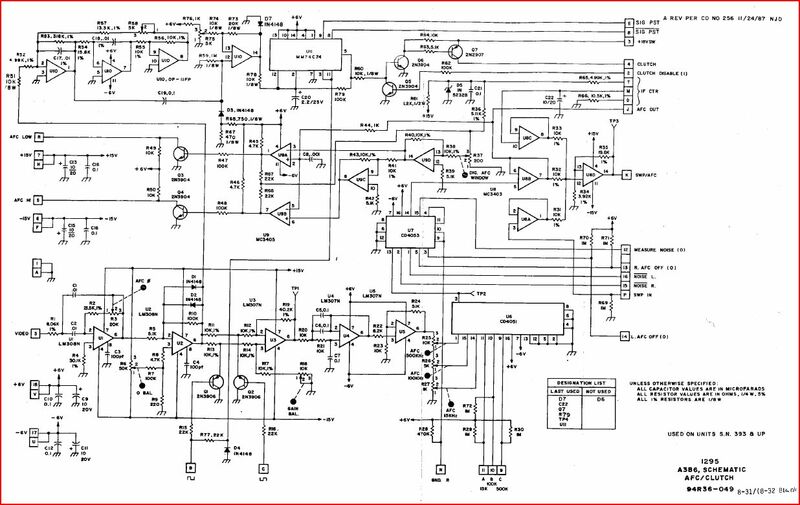 Tackling this through a lowpass in the coarse tune feed line (from the coarse tune DAC) didn’t change a thing – the noise is getting into the YIG driver from instrument-internal sources, or partly from the opamp (U5, LM308) itself, when it is left running at full bandwidth. As a side comment, note the power amplifier – it is a LH0021CK 1 Amp opamp, in a very uncommon 8 lead TO-3 package. Hope this will never fail. Usually, I don’t want to modify test equipment of this nature, because there is nothing worse than badly tampered high grade test equipment. All conviction aside, 2 X7R capacitors, 100 n each, were soldered in parallel to the R38 resistor, so there will be some bandwidth limitation of the YIG driver, even with the K1 relais open. With these in place – the noise issue is gone. 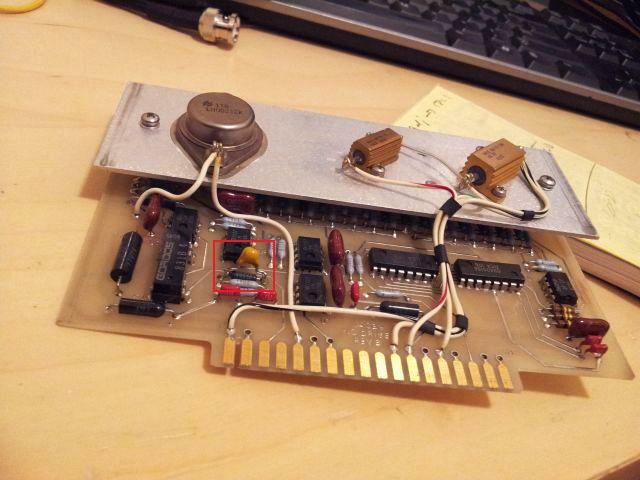 Now, triggered by this discovery – the SG-811 uses a very similar YIG driver board, which also has a low pass engaged, in the CW mode – however, not in the remotely controlled CW mode, with externally settable frequency… easy enough, just one of the logic traces cut, and now the filter stays in – don’t plan on sweeping it with a fast acting PLL anyway. 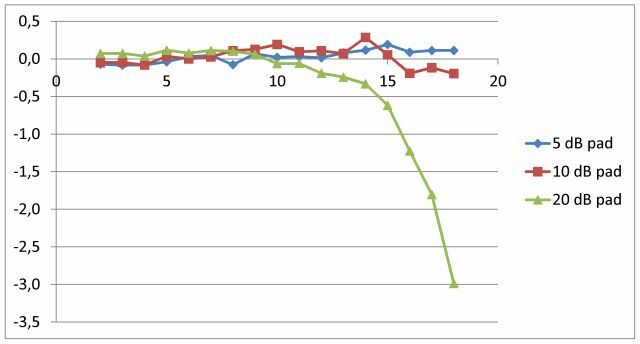 Back to the fractional-N loop: after some tweaking, the current loop response seems quite satisfactory. 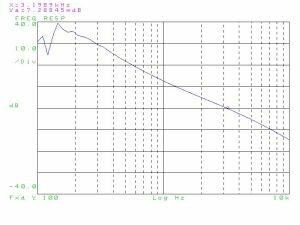 Set at 3 kHz for now, with plenty of adjustment margin, by using the 16-step charge pump current setting of the ADF4157. 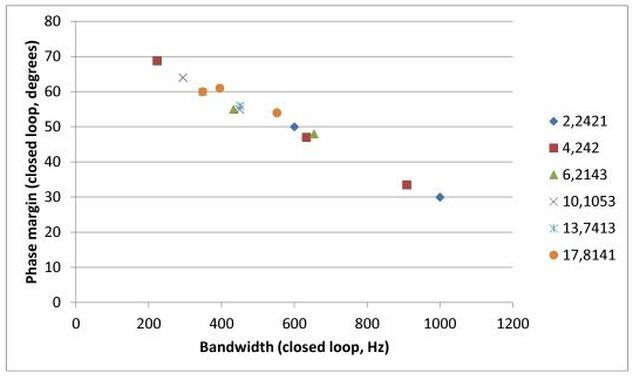 Getting 45 degrees phase margin (closed loop) at 3 kHz – therefore, should also work at higher bandwidth. Will see if this is necessary. With the work on the Micro-Tel SG-811 generator PLL mostly completed, some trials with the Micro-Tel 1295 receiver – this instrument has similar YIGs fitted, just needs to be tuned 30 MHz above the actual frequency tuned, because the 1295 is running on a 30 MHz IF (all diagrams have tuned frequencies, not LO frequencies). 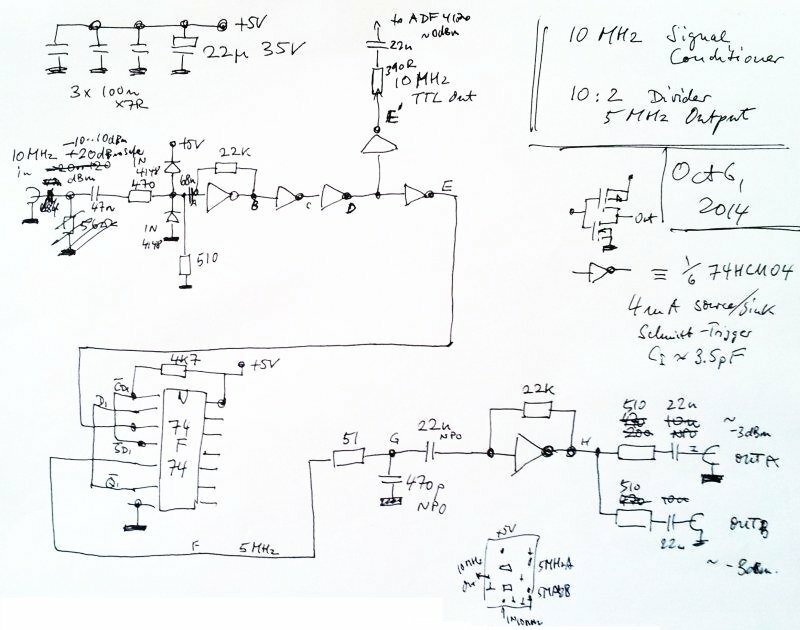 After some crude analysis of the schematics, the 1295 seems to be able to handle a bit more PLL bandwidth – so the target set more in the 500 Hz to 1 kHz region, and some calculations were carried out with the ADIsimPLL program, to determine the rough capacitor and resistor values – otherwise, the loop filter is the same as for the SG-811 PLL, also using an OPA284 opamp. After quite a few of these measurement (doesn’t actually take too long), the results. 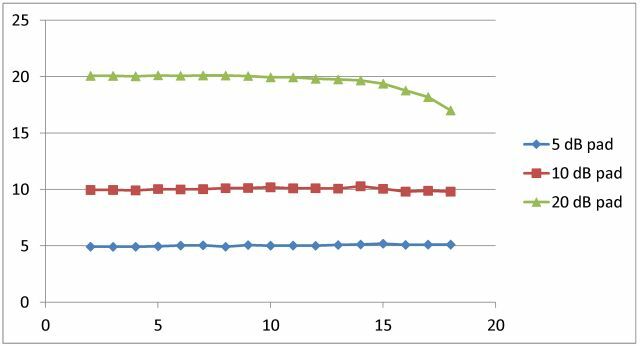 Again, a bandwidth frequency^0.7 product could be used to get the numbers down to two parameters – slope and intercept of the bandwidth*frequency^0.7 vs. Icp setting curve. The result seems quite satisfactory, pretty much constant 600 Hz BW can be achieved over the full 2 to 18 Ghz range, at about 47 degrees phase margin. This should allow for stable operation. No locking issues were observed at any of the frequencies, even with full Icp current. (1) The Analog Devices ADF4157, 6 GHz, 25 bit fixed modulus fractional-N PLL – this part is really great, for many purposes. 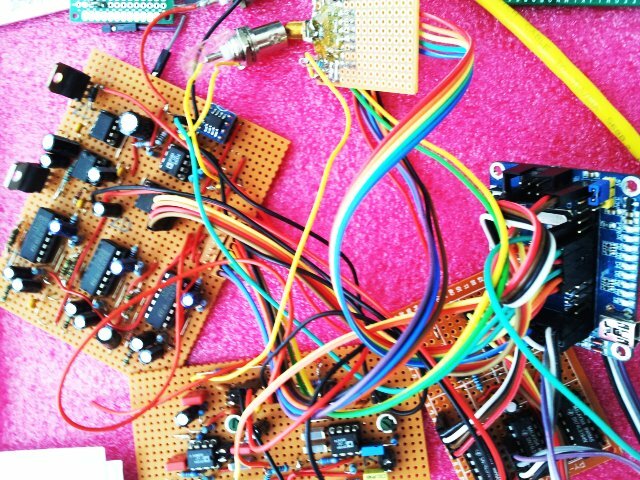 It’s more or less pure magic what these folks at Analog do and achieve. 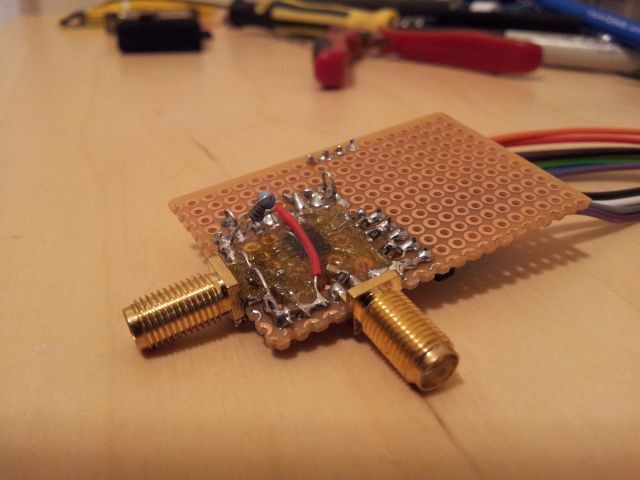 (2) To make it work up to 18 GHz, a prescaler is needed. Well, unfortunatly, I only have a :8 prescaler (ADF5002) around – this will give 0.25 to 2.25 GHz, for the 2 to 18 GHz input. 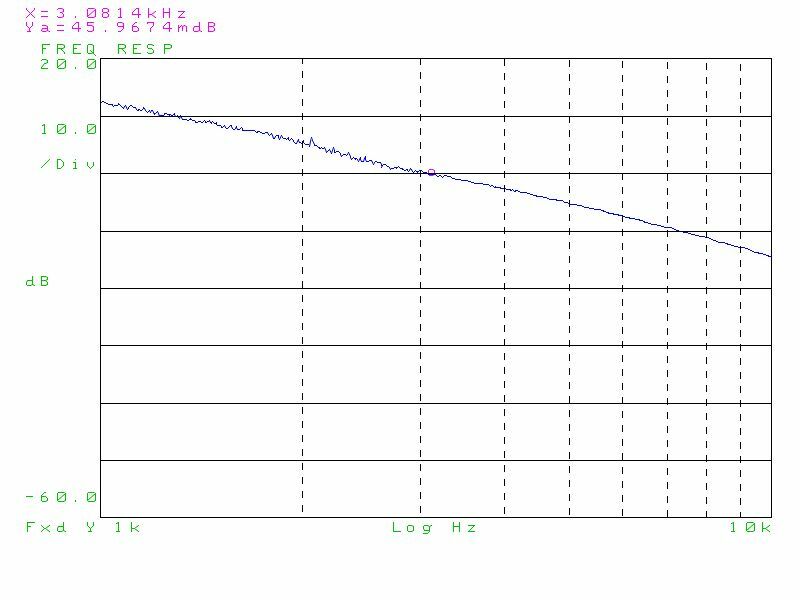 Not quite ideal, because at 2 GHz it’s getting really into low frequencies for the ADF4157, and the output power of the ADF5002, which is a more-than-sufficient -5 dBm in the 4 to 18 GHz, range, but dropping off to only about -10 dBm at 2 GHz. 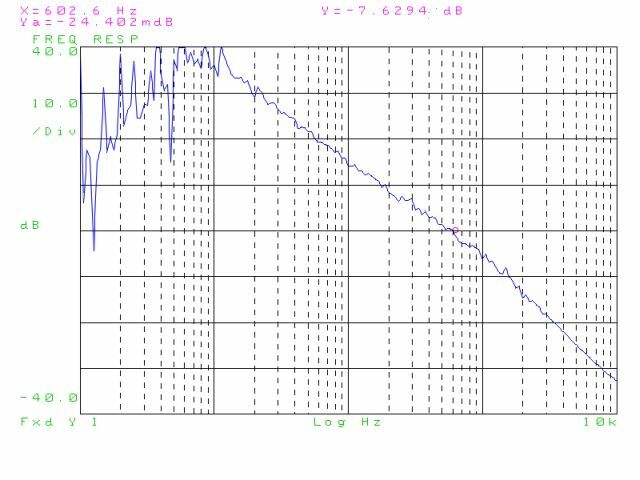 At the same time, RF input sensitivity of the ADF4157 drops considerably for input frequencies below 0.5 GHz… we will see. With a 10 MHz reference clock, and the phase detector frequency set to 1.25 MHz (reference divider=8), this will result in 10 MHz steps, with 2^25 spacings in between. This gives about 0.298 Hz resolution. 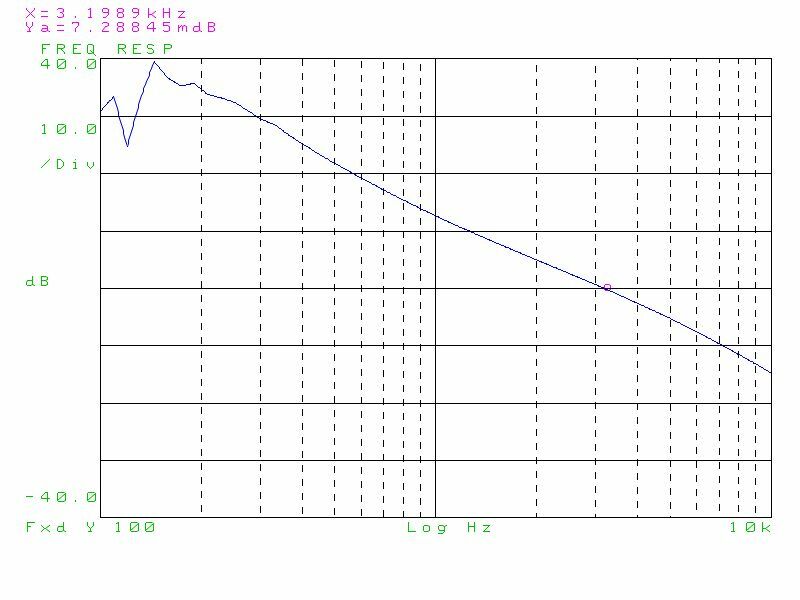 And moreover, with this setting, 10 MHz steps are possible, with no fractional-N divisor (which can always lead so some rather unpredictable fractional-N spurs). 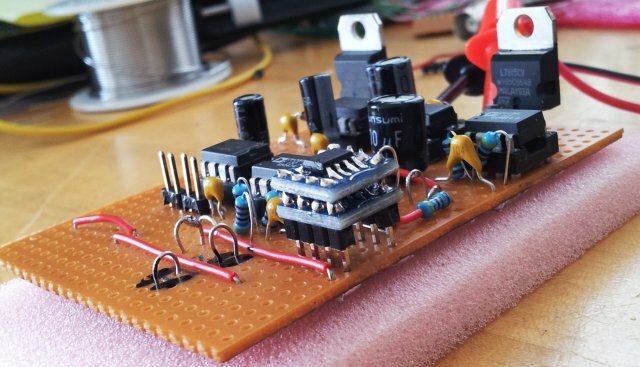 The circuit – there is no big secret to it, a 5k1 reference resistor to set the charge pump current to 5 mA, and a few 6k8 resistors (0805 SMD) to make the chip compatible to a 5 V digital world. 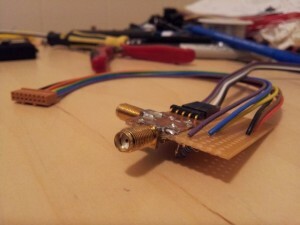 Two SMA connectors – one for the signal, and one for the 10 MHz reference. All wiring is done with 0.08 mm tinned copper wire… hope you have a steady hand. With a drop of epoxy glue, everything is held in place and well-protected. 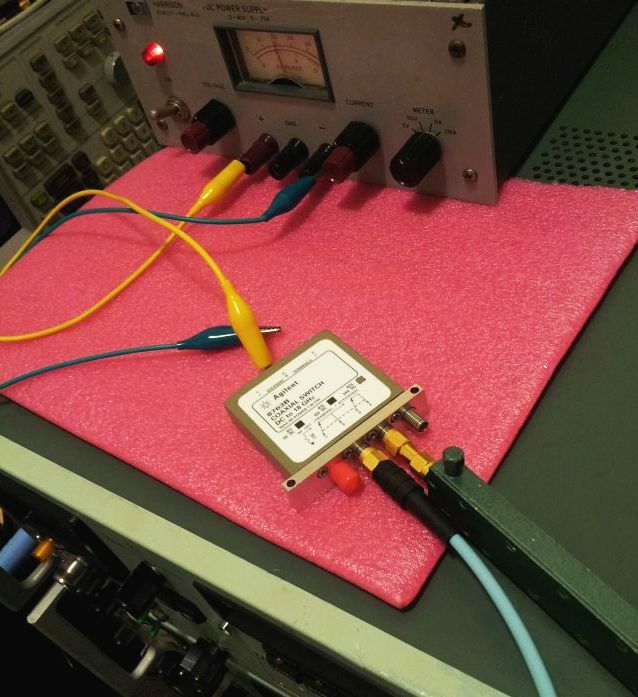 Tests will follow – currently the loop bandwidth tests are running for the 1295, with the ADF41020 PLL.